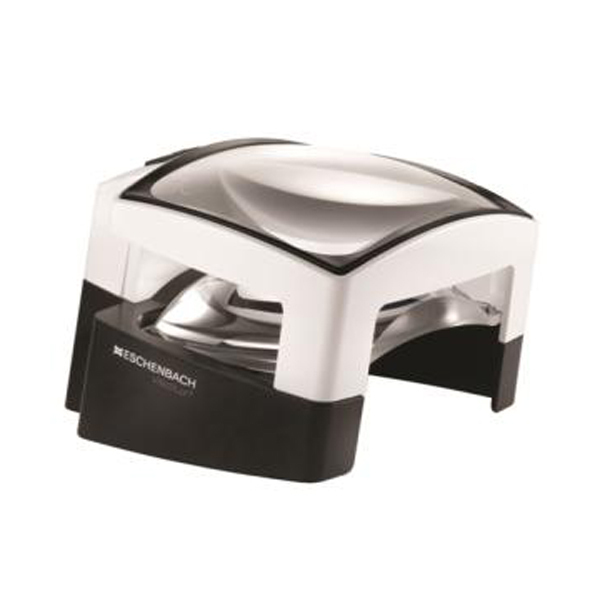 The Visolux+ is a new, illuminated stand magnifier from Eschenbach with many features that will please users including its greatest benefit: a large, distortion-free viewing area illuminated with bright LEDs. The VisoLux+ is easy to use. Simply push the ON button, place it over reading material, photos, coins, or stamps, and you’re ready to go! It has a unique, double lens system that features a patented hard coating that makes the lenses nearly glass hard. This coating minimizes scratches so text and images appear crisp and clear—the coating also extends the useful life of the product as well. The field of view is larger than most stand magnifiers – a full 100 x 75 mm or 4 by 3 inches, which means users will be able to see many more words at one time than comparable 12 Diopter lenses without having to move the magnifier. This makes reading newspapers or magazine articles that much easier without losing your place on the page. The VisoLux+ contains 2 bright SMD-LEDs that provide uniform illumination over the entire field of view. There are two color options to choose from – standard bright, white light and a softer orange light which can be selected by sliding the built-in filter over the LEDs.